The three-row CX-9 remains a favorite with families who enjoy having the extensive interior space. The elegant, seven-passenger SUV now has a few upgraded tech features. See the 2019 CX-9 in person at our Schofield facility. Link your smartphone or other mobile devices with the sound system to listen to your favorite playlists. Make and receive hands-free calls and text messages. Access your navigation apps to plan your journey or locate fuel stations, restaurants or shopping centers. Android Auto or Siri enables you to control the system by simply verbally providing instructions. Seasonal weather often makes driving challenging. But, the active AWD system continually monitors conditions and makes the necessary adjustments. Along with getting an outdoor temperature display, the system ensures that the right wheels receive the traction they need when they need it. 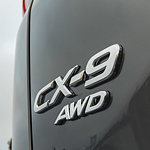 Try the CX-9 out on the road by visiting Fred Mueller Mazda.